6 week old Labrador pups being taught basic obedience and â€œattentionâ€� through positive reinforcement alone. Observe that no leash is used. We generally begin with adolescent dogs that are very carefully selected and tested to ensure they have strong drives and confidence to undertake the tasks for which they are to be used. We also have a breeding programme that follows scientific techniques such as neurological stimulation after birth and scent imprinting while still in the nest. All our training is based on â€œoperant conditioningâ€� which uses techniques that are entirely based on positive reinforcement and the dogs, whether puppies or young adults, are allowed to learn totally on their own with the trainer merely reinforcing wanted behaviour while ignoring what is not desired. This produces dogs that have a great enthusiasm for learning, enjoy their work and learn to solve problems without any assistance. 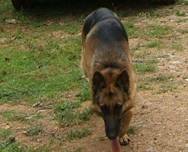 Thus the dogs trained by us have a strong â€œobedienceâ€� to odour and are handler independent. Initial training for detection of substances is done in a laboratory type environment with extreme care so as to be absolutely certain that the dog learns to detect only the specific odour of the active ingredient that we want it to and not by relying upon any other concomitant cues such as additives, wrapping material, solvents, disturbed surroundings, handler scent or odour left behind by dogs trained earlier etc. etc. Once the initial scent is strongly imprinted, other locations and distracting auditory, visual and olfactory stimuli are introduced gradually and increasingly. Different search patterns such as that of vehicle, open area, building and other searches are then taught. Once thoroughly learnt, the rest of the odours in the bouquet are taught, quantities changed, contamination is increased, environments changed etc. to produce a well rounded dog ready for testing. After being statistically tested for satisfactory performance in high ambient conditions for a duration of at least 30 minutes of continuous work and obtaining in excess of 95% detection levels without any false alerts, a dog is released for active deployment. Chief Consultant Mr. Billy L Smith Sr.